At the Inn, he lives a cozy life: he eats for two hours at 8am, 12pm and 6pm, and spends the rest of his time wandering around the Inn, talking with his colleagues and the other guests. He sleeps between 10pm and 6am. After 6pm, he sometimes gets sneaky and tries to pickpocket a random person at the Inn, but since the place is so crowded, he is usually caught. When the related quest is initiated, he and the other two thugs travel to the Ayleid ruin of Malada, where they set up a camp directly west of the ruin's entrance. When not sleeping in the camp between 10pm and 6am, he is guarding the entrance from a southwestern cliff. If you approach him at the camp, you can make a deal with him: He will fight the other thugs instead of you in exchange for a share of your quest reward. As soon as you leave the ruin, he is ordered to attack you. However, if you previously made a deal with him, he'll help you kill the others. If he survives the quest he will make his way back to the Roxey Inn by using an unmarked road leading west past Mackamentain, going northwards along the Yellow Road and by turning right on the Red Ring Road. He switches to his regular schedule when he gets there. After you have gotten your reward, and if you signed a deal with him, he'll make his way to the Tiber Septim Hotel by going westwards along the Red Ring Road and crossing the bridge to the Talos Plaza District. He will wait there until you arrive with the money. If you pay him, he will return to Roxey Inn following the same route. These schedules will only be interrupted by his eating and sleeping times. He will search actively for food or a bed at these times, which might get him into trouble. If no food or beds are present near him, he will stand still until his next action begins. Upon arriving at the Roxey Inn, he will resume his normal schedule once again. If you decide not to pay him, however, he'll follow you anywhere until you leave the city, at which point he'll attack you. He is always clad in a complete set of leveled light armor, except for the shield and the gauntlets. When it's time for him to sleep, he will change into a huntsman leather pants and a huntsman vest, but he will keep his boots on. In combat, he relies on a leveled bow and leveled arrows. The numbers of arrows can easily exceed one thousand at higher levels. When things get tight, he switches to a shortsword, which is also leveled but its quality will not exceed glass. Due to a glitch, the amount of money he carries at higher levels may amount to thousands of gold. Since the Roxey Inn is so crowded, he can't be sure to get a bed. If that's the case, he's forced to wander around all night. 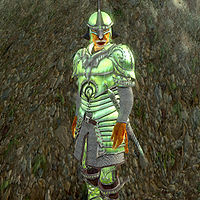 If you accept S'razirr's help during the related quest but then decide to turn the carving over to Claude Maric, S'razirr, upon completion of this quest, will be stuck in The Tiber Septim Hotel for the rest of the game. He's waiting for his reward, but because of the way the quest has unfolded, he doesn't have the dialogue option to let you give it to him.